It is simple, easy and safe. Gently press the pre-waxed strips onto the area and then pull-off. The face or body strips lift away unwanted hair from the root, leaving your skin soft and beautifully smooth for weeks. 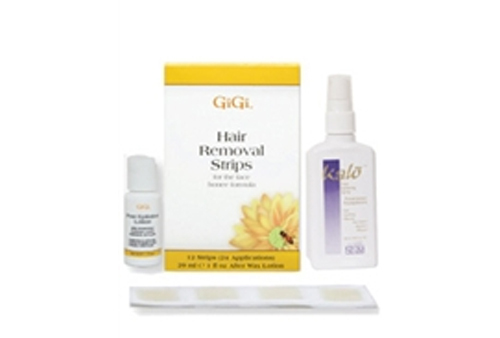 Contains: 24 Applications and Kalo Post Epilating Spray Apply the Kalo directly after removing the hair 3 times the day of hair removal and 3 times the next day. 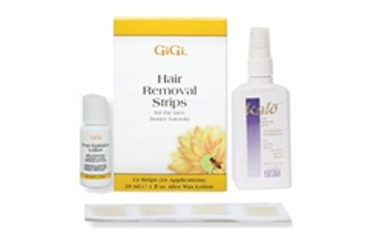 Kalo will prevent about 10% of the hair from growing back after each hair removal session. The after wax lotion should not be applied until your final (3rd) application of Kalo Post-Epilating (Hair Removal) Spray has been applied for the day.